Thyroid surgery is a large part of our surgical practice with up to four thyroid surgeries per operative day. Thyroid nodules are quite common. I tell patients that, “Approximately 50% of adults by the age of 50 have thyroid nodules. Most are benign, but like masses in the breast for women or prostate nodules for men, they require due diligence.” This begins with a fine needle biopsy. If benign, the national protocol which we adhere to is to repeat thyroid ultrasound studies twice a year for comparison and signs of change. If biopsies are indicative of cancer or the possibility, this requires surgery of the involved half of the thyroid. Surgery requires retraction of the nerve to the vocal cords as well as dissection of the glands that control calcium – the parathyroid glands. Sometimes but rarely, this nerve will become weak, leading to hoarseness. Typically this will come back but not always. 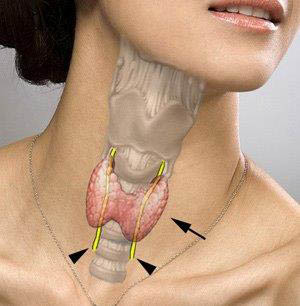 Parathyroid surgery is also a significant part of our practice though not to the level of thyroid surgery. I was fortunate to be the first surgeon in the region to perform Minimally Invasive Radioguided Parathyroidectomy or MIRP. In the rare cases where the parathyroid adenoma cannot be identified, these patients are sent to Springfield at SIU where their technology can often identify more challenging tumors. Surgery for the salivary glands is also provided. The largest salivary gland, the parotid gland, is also the most common sit for salivary gland tumors. The facial nerve is intricately involved in the anatomy of the parotid gland and is treated very gingerly and seriously, including with facial nerve monitoring. Fortunately in this wonderful community, head and neck cancer is less common than many other areas. This, too, is a surgery that we provide when necessary. Again not a surgical procedure, Botox injections for patients with facial spasms is offered. These, too, are very grateful patients and thankful to significantly decrease the annoying and socially embarrassing facial spasms.